After the tedious exams Civil Engineering students has to go through to pass the Board exams, finally the most awaited moment has come! 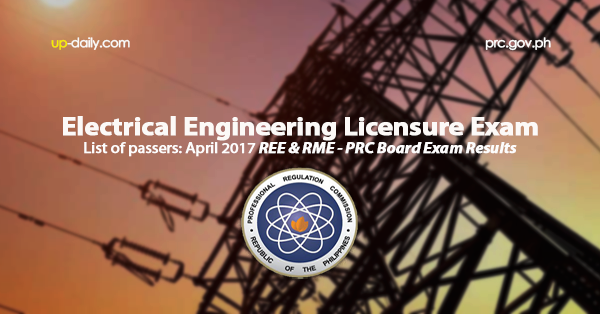 According to Professional Regulation Commission (PRC) out of the 2,213 takers 994 Registered Electrical Engineers and 3,130 takers 1817 passed the Registered Master Electrician passed the April 2017 Electrical Engineer Licensure Examinations, approximately 44.91% for REE and 58.1%, RME. The said examination covered the following cities: Manila, Baguio, Cagayan de Oro, Cebu, Davao, Iloilo, Legaspi, Lucena and Tacloban given last 18, 19, and 20th of April 2017. * 2 sets of documentary stamp. This is an exciting moment for all passers, especially the Top Notchers led by Kent Meyler Malones Samaranos from Mindanao State University Gen. Santos City with an average rating of 90.90%.